"Crime & Punishment" / "The Bank Job"
After last week’s dirty cop introduction and reveal in “The Slaughterhouse,” this week’s Brooklyn Nine-Nine finale has things escalate quite quickly on that particular story front. In fact, finally, (part of) the Nine-Nine’s existence is threatened with some high stakes… But it’s also to somewhat uneven results. The underwhelming nature of this B-plot is especially disappointing, because it comes with the pretty gutsy choice of Brooklyn Nine-Nine actually making Gina pregnant. Last season, the show got really creative with hiding Melissa Fumero’s pregnancy, to the point of getting Amy fake pregnant at one point. But since returning from “The Fugitive,” it’s also been pretty comical just how little they’ve done to hide Chelsea Peretti’s real life pregnancy, instead simply opting to go with the standard choice of having her sit a lot or stand behind things. The fact that the show doubles down on just barely doing anything to hide it by also making Gina pregnant is a pretty big deal in a season finale that hinges on an even bigger deal. But the circumstances that lead to the reveal are barely even a plot, and it’s not as if the show saves more of it for part two. When it comes to this part of the episode, here’s what the episode synopsis for “The Bank Job” says: “Meanwhile, Boyle objects to Gina’s new boyfriend (guest star Ryan Phillippe).” That’s it. That’s literally what this is, and it’s also literally just one scene in the episode. It’s also something Boyle gets over by the end of the same scene, after Amy and Terry point out that Milton Boyle (Phillippe) and Gina are absolutely perfect for each other. Brooklyn Nine-Nine can spin entertainment magic out of the simplest plots, but here, it really feels like the smallest amount of effort is put in with the hope that the cast will do the rest. On the bright side, those few seconds of Phillippe are a fun introduction for Milton, especially as a new character who’s kind of stuck with the Nine-Nine now. (He knocked one of their own up, after all.) I just wrote a couple of weeks ago about how the Linetti/Boyle family union has kind of removed Gina’s family identity separate from the Boyles, but now this particular romantic (and life) choice with Milton Boyle at least adds a new layer to that. He’s physically nothing like the rest of the Boyle family, which honestly helps in terms of having a new perspective when it comes to that family’s overload of “beta-ness,” and he understands and appreciates Gina, which is key. At the same time, Brooklyn Nine-Nine makes sure to end the scene with a reminder that, despite his “black sheep” status, Milton is still a Boyle through and through: His “Bye, Charles. I love you.” is very Boyle-esque, and Charles’ disgust with him and gritted “I love you” back makes for an interesting dynamic. It’s a slightly more mean-spirited version of how Boyle doesn’t get Terry’s physical appeal (though Boyle can be mean-spirited toward Terry too, as he calls him a “rube”). Things move ahead two months in that second episode, and while the time jump is obviously necessary for Jake and Rosa’s court trial and Boyle’s stressed out hair gag, it’s actually quite surprising Brooklyn Nine-Nine doesn’t take more advantage of the fast forward. Two months later, and there’s somehow no change (or even mention) on the Gina/baby Boyle front, and besides the case and the Nine-Nine’s role in helping out, everything really feels the same. Like two days passed instead of two months, really. Yes, a two month time jump doesn’t mean a show has to go full Parks & Recreation, but come on. Not even a little bit of fun with the technique? Besides killing Pizza Rat (R.I.P. Pizza Rat), that is. However, the distance from Jake and Rosa’s failed undercover infiltration attempt does allow the show to get back to a more ensemble-based groove. But even that’s tainted by the ever-present knowledge that Hawkins really screwed Jake and Rosa in the most tremendous way possible. Seriously, it’s absolutely absurd just how intricate Hawkins’ entire corrupt operation is, and if nothing else, it’s worth it for Gina Gershon’s dead-pan reactions to everything. It’s pretty depressing that all hope is lost from moment one, but Hawkins telling everyone that Jake and Rosa are “super duper guilty” is also sickly amusing. There’s really a lot of fun to be had in this episode, in the face of the general stress. The court scenes probably work the most in their general simplicity, especially as the humor settles on subverting the audience and characters’ expectations, right up to the final verdict. Obviously, there are the “airtight alibis” that end up being not so airtight, but there’s also the eventual betrayal by “surprise witness” Matthew Langdon (Brent Briscoe) after he and Jake were “vibing so hard.” But I’d also argue that Judge Marinovich (P.L. Brown) steals the show in the courthouse scenes, not just in his constant overhearing of Jake’s poorly-timed bank robbery jokes but in his beautifully deep voice that instantly makes every line reading better. Sure, we already have Andre Braugher on a regular basis for that type of thing, but P.L. Brown is a treasure in this small role. As for the pairings here, even though everything in this episode is also in service to Jake/Rosa, it’s not exactly the same as the characters only existing to await orders from their plot. The rest of the characters are actively involved, and we get Jake/Amy (their romantic version of “The Last Ride”), Terry/Boyle and some Terry-targeting hackers, Holt/Rosa, and Gina/courtroom “wisdom.” Despite Jake/Amy’s continued declarations of love here (more on that later), it’s Holt/Rosa who bring the heavy emotion to this episode, with Holt reminding Rosa that the Nine-Nine is her family and they’ll help get her through this. Ultimately, things come crashing down for Jake/Rosa far too quickly for anyone to fully process that Holt was kind of wrong and she really should’ve made a run for it, but it’s still great while the moment lasts. In fact, in all the chaos, “Crime & Punishment” at least finds time to show how Jake and Rosa both approach this whole situation; Jake constantly repeats that everything will be fine, even when it clearly won’t be, while Rosa quickly sees the writing on the wall and plans to run away to Argentina with Pimento. The Holt/Rosa “family” aspect of this episode is actually kind of necessary, because without it, it’s even easier to get frustrated with just how badly everything goes for Jake and Rosa in this episode. Because things go really badly for them. The Jake/Amy plot is also a necessary one, because it solidifies perhaps the one constant of Brooklyn Nine-Nine’s fourth season: Jake and Amy are a healthy, stable couple, and that’s just the way it is. It’s worth high-fiving, really, as they and the show constantly prove that a happy, normal-ish couple doesn’t mean boring couple. And if you want conflict for the couple, then here you go, because Jake’s just been found guilty of running a bank-robbing ring. Jake and Amy both love each other, she’ll wait for him, etc. It’s nice, in an arc where niceness really isn’t rewarded. The love, the family—it’s what Brooklyn Nine-Nine is all about, and at the same time, it’s all in contrast with what’s actually happening to these characters right now. 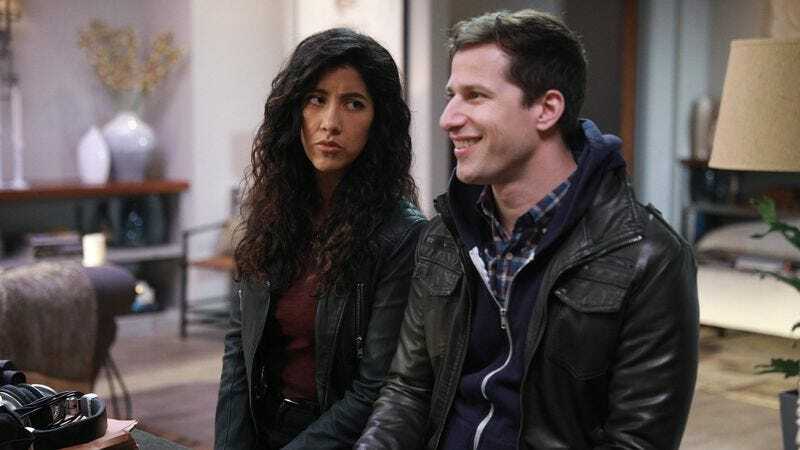 Based on Brooklyn Nine-Nine’s general body of work, at the beginning of this episode, the optimistic side says Jake and Rosa won’t be found guilty. But the pragmatic side that pays attention to the show’s habits says maybe they will, just to give the show something big to go out on. Of course, the latter happens, but because of that former, optimistic side, it’s still a bit of a shock to actually hear the words “GUILTY” end the episode, no tag or epilogue to make things better. There’s Jake’s very appropriate, very stressful rapid succession of “cool” to close it out, but that’s it. After all the Nine-Nine has been through this season—which Jake even pointed out in “Cop-Con”—”Crime & Punishment” finds a way to top that closing out the season. As a season finale, it’s somewhat disappointing the court case doesn’t end up being a true culmination of this season, either calling on friends or enemies to offer some sort of aid in the face of the Nine-Nine’s biggest obstacle yet. “The Bank Job” does the friends thing with Pimento, but he’s also romantically linked to Rosa; his presence is like if the show remembered Genevieve (Boyle’s girlfriend, Nikolaj’s mother) exists and brought her back. Brooklyn Nine-Nine’s final episode arcs don’t typically come together like that, but as big a deal as this case is, it’s a missed opportunity. It’s also part of the reason this feels like an anti-climactic season finale, right until the moment the guilty verdict comes out. Jake and Rosa are on trial for a bank robbery ring. Those simplistic court scenes are fun for what they are, but the lack of even character witnesses for these two—or anything on their side to create reasonable doubt—is a greater hindrance to Jake and Rosa than the ticking clock they have to prove Hawkins is the true criminal. And it’s a really risky choice on Brooklyn Nine-Nine’s part. I’ve written before about how the series can have trouble creating stakes that actually come across as “real” stakes, and now we have a choice that can really affect the show moving forward. Is it good? Is it bad? I honestly have no idea at this point. It’s big, but big can mean so many things. We’ll just have to wait and see. Wait, rewatch, and see. This week in webisodes Brooklyn Nine-Nine needs: I think we need an Imposters-like spin-off with Rosa and her disguises, but in terms of webisodes, I’d love to see the jury deliberation for this mess of a trial. There are some knowledgeable folks in the comments, so: When would Amy know whether she passed her sergeant’s exam or not? Obviously the fact that the hackers are played by Eugene Cordero, Kulap Vilaysack, and Scott Aukerman contribute to this particular vibe, but the actual bit of each new hacker showing up (and then hacking poor Terry) feels very Comedy Bang Bang-esque. That includes how much it has their characters actively ignore the tight deadline that Boyle and Terry are on to help Jake and Rosa, as well as the restaurant setting, Hey Hey, It’s Wednesdays (“Where it’s never the weekend” and has a weird 24/5 schedule). Jake: “Just put on anything by Enya. No, not anything. ‘Orinoco Flow.’ On repeat.” The courtroom walk-in to “Orinoco Flow” is also on point. It all goes downhill from there, of course.